Cables may look very similar on the outside, but they have some big differences on the inside. Cables are standardized into different categories. Each cable with a higher number is a newer standard that typically supports communicating at faster speeds (if you have modern devices that support it). The connector type is the same regardless of category so old cables can still plug into the newest devices. If you aren’t sure what type of cables you have, look at the text printed on the cable—usually it will tell you what type it is. Another thing to know, is that you shouldn’t notice a decrease in speeds unless you are using cables longer than 100 meters. Category 5, known as Cat5, is an older type of network cabling. Cat5 cables were made to support speeds of 10Mbps and 100Mbps (Very slow!). Category 5 enhanced cabling, aka Cat5e, was made to support 1000 Mbps (gigabit) speeds so it’s a lot faster than Cat5. It also cuts down on crosstalk, the interference you can sometimes get between wires inside the cable. Both of these improvements mean you’re more likely to get fast, reliable speed out of Cat5e cabling compared to Cat5. 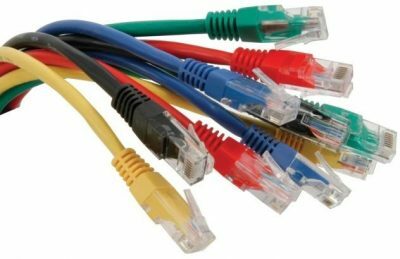 Category 6 and Category 7, Cat6 and Cat7 respectfully, have even stricter specifications when it comes to interference, and in some cases is capable of 10-Gigabit speeds, with Cat7 being known for its durability and longer life span than its predecessors. For typical home networks, these newest cables aren’t really necessary (at this point in time!) as your Internet connection is the bottleneck. It’s important to note that your network speed is different than your internet speed. Upgrading your cables isn’t necessarily going to make a difference in how fast you load Facebook. Your internet speeds are still much slower than speeds on your network. However, if you’re transferring files between computers, using gigabit-compatible hardware and cables can make things move along faster and upgrading the cables is very cheap— you can buy cable for just a few dollars (depending on the length).